With a little attention to design, even the most modest patio can become a lively place to entertain friends, an inviting refuge that helps you unwind after work, a cozy spot for lazy Sunday breakfasts, and a lot more. While the flooring of your patio, porch, outdoor kitchen or other outdoor spaces might not seem like a critical factor, it has a subtle yet powerful effect on the ambiance of the entire space. Whatever mood you want to enjoy in your outdoor space, there’s a flooring material that will help you create it. Simple and durable, concrete is one of the most popular materials for patio flooring. It’s also highly economical, costing relatively little to install, maintain, and repair. Weekly mopping is all that’s needed to keep the floor clean. Cracks can simply be refilled and the area resurfaced. With this basic care, a concrete floor can stay looking good for decades. 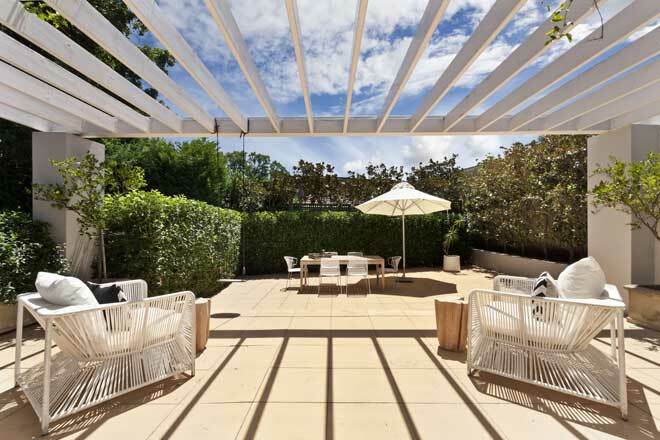 Concrete’s modern, minimalist feel is perfect for simply furnished contemporary outdoor spaces. This material doesn’t have to look austere or industrial, though. Polishing concrete gives it a bright luster and smooths over the fine cracks and variations in shade to create an appearance that’s more like natural stone. Stamping concrete with wood grain, brick, stone or other prints adds an elegant, luxury look. For a colorful, artistic touch, you can incorporate materials such as recycled crushed glass or plastic. Stains and finishes are available to give your concrete floor a customized look that fits the character of your patio. You can pour a concrete slab patio yourself, but this is only a good idea if you have experience working with concrete. The material sets quickly, so you won’t have much time to correct any mistakes. Hiring a professional ensures you’ll get a floor with a smooth surface, good drainage, and neat edges. 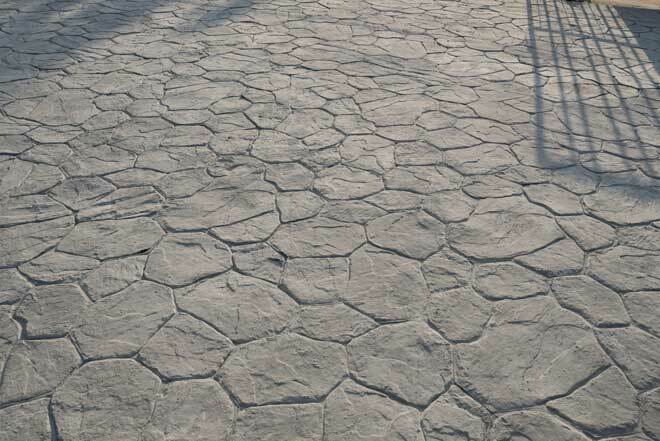 Pouring concrete isn’t the only way to use this material for the floor of your patio or other outdoor space. 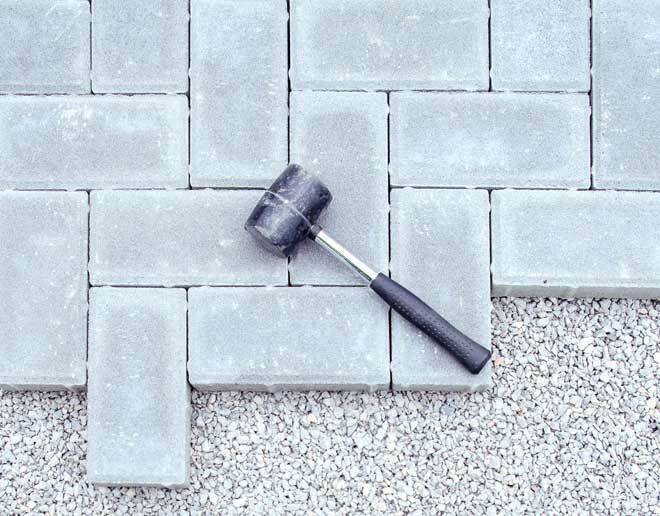 Concrete pavers, or patio pavers, offer the durability and ease of maintenance of concrete without the difficulties associated with pouring concrete slabs. In fact, because pavers are manufactured to high standards in a controlled environment, they’re often more durable that poured concrete slabs. 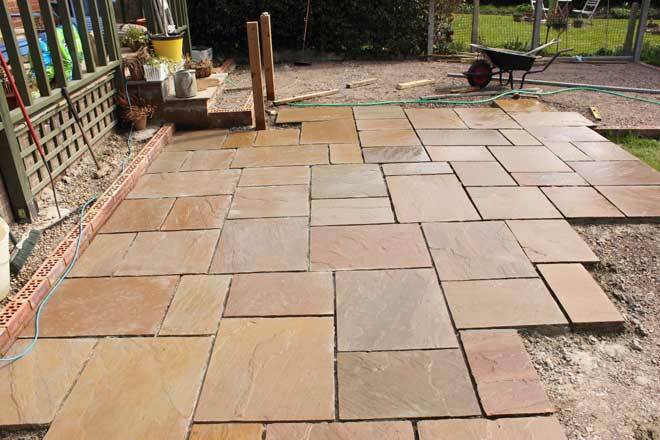 Repair is also easier because you can simply replace any damaged pavers rather than having to patch damaged areas as you would with a concrete slab. 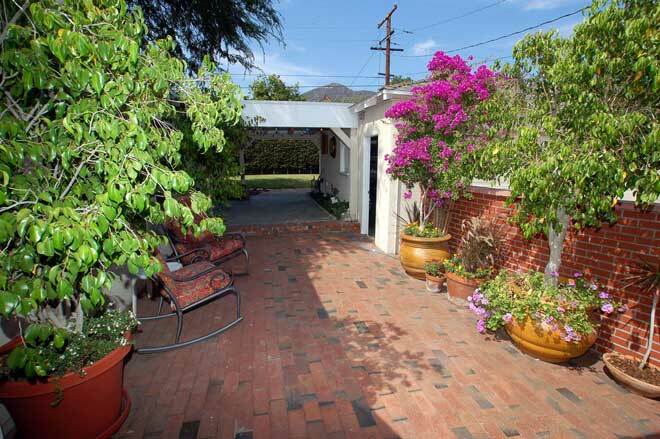 Use permeable pavers and you’ll also have less runoff water to deal with. Concrete pavers come in a wide variety of sizes, shapes, and colors, giving you plenty of latitude to create a customized design that expresses the mood you want in your outdoor space, whether that’s casual and playful or formal and elegant. Because concrete pavers are easy to handle and require no special equipment to install, creating a floor with them is a fairly simple DIY job. Even so, a little research into the proper installation process will pay off in the form of a more attractive, longer-lasting finished product. Brick has an old-world charm and warmth that’s the perfect fit for older wood and brick homes, but this classic paving material can look good in nearly any environment. Like concrete, brick is economical and durable, lasting decades if correctly maintained. It resists singeing damage, making it a good choice for an outdoor kitchen where the occasional hot pan might hit the floor. Because the mortar between the bricks is susceptible to water damage, you’ll need to apply a sealant to prevent cracks and mildew growth. There are a variety of brick patterns, such as running bond (the most common), basket weave, and herringbone to help you get the look and feel you want. As brick ages, it takes on a soft, timeworn appearance with color nuances that are unique to every floor. Many homeowners appreciate this change, but if you want your floor to look exactly the same for years, brick isn’t the right material for you. As an added benefit, brick is a sustainable flooring material because most of the ingredients, such as shale and kaolin, are natural and widely available. Brick is also easy to salvage and re-use. Laying a small brick patio with a simple design is something a moderately skilled DIY enthusiast can manage in a few days. If you want a large patio or an intricate design, though, you’ll be better off hiring a professional. Wood is an excellent flooring option if your goal is to create a rustic, close-to-nature atmosphere on your patio. It has a warmth and coziness no other flooring can truly match, and as a natural material, it provides an attractive transition from outdoors to in. On the downside, wood requires more upkeep than most outdoor flooring materials. You’ll need to make sure neither water nor leaves and other debris linger on its surface or between the boards. Once a year, the floor should be washed with the appropriate cleaner and sealed. Nails and screws can become damaged or go missing and should be replaced. If you’d rather not go through all that trouble, consider wood composite flooring to get the look of wood with somewhat less maintenance. 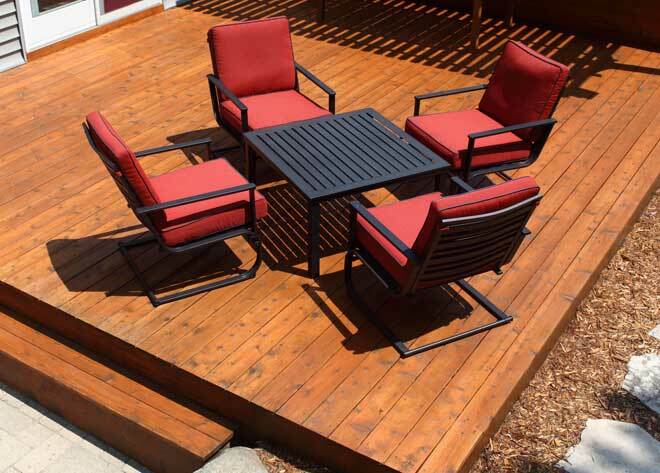 Red western cedar, redwood, ipe, and cypress are some of the most popular wood species for patios and other outdoor spaces thanks to their rich color and durability. There are two options for building a wood floor outdoors: planks and decking tiles. Building a patio or deck using wood planks requires skill with pouring concrete and woodworking, but it’s something an experienced DIY enthusiast can accomplish in a few weekends. Decking tiles are manufactured as small, individual units designed to be snapped together. These can be installed over an existing wood or concrete surface or even on soil. They’re easy to assemble, so building a floor with them is the perfect beginner DIY job. Stone flooring lends your space a traditional feel, but also blends well with the outdoors. It allows you to create either a luxury or rustic look, depending on the type of stone you choose. Because stone can stand up to heavy foot traffic, it’s a good choice if you plan to do a lot of entertaining on your patio. No two stone pavers are exactly the same, so every stone floor is unique. How much maintenance your stone floor requires depends on the type of stone used. Some stones are more porous than others, so they require more frequent sealing. Some are more prone to chipping and scratching than others. When choosing stone for your floor, take time to investigate the physical properties and maintenance requirement of each. Stones that work well for outdoor flooring include marble, travertine, granite, limestone, flagstone, and slate. Stone quarried locally will cost less than stone brought in from another part of the country. Building a stone patio with a free-form design is a moderately complex DIY project that will take several weekends to finish. If you want a design that requires more precision, consider hiring a professional installer. The right flooring material can help you bring the atmosphere you want to your outdoor space, whether that’s modern and casual or more traditional. For a low-maintenance floor with a laid-back look, consider concrete. If you’re going for a classic, time-honored style, brick and stone can help you create it. To add a naturally warm, homey appeal to your outdoor space, try wood.